Something amazing happened at The Cathedral Cafe last Sunday. Some cookbooks were launched, literally. The Food Canon was giving his speech. We were told that he often breaks out in Singlish when he is nervous. That he did in full flight. Welcome all and one to this…I mean, one and all, to the lunch of my cookbook. Sorry, I meant - the launch.... Heh, I am a bit nervous. Pai Seh Pai Seh. Forgive my Singlish hor? When I get nervous, I speak from my heart, and all the hors and lors will spill out. This cookbook is all about my late Mum. And a little bit of me. 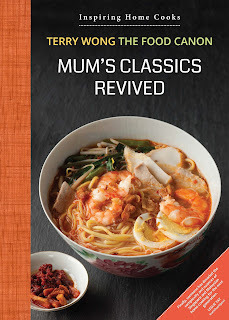 As you can read on the front cover, it is about Reviving my Mum’s classics. And little me, ahem, on the back cover. When I first started on this cookbook, I had over a hundred recipes in mind. Yes, imagine a 200 recipes cookbook. Good value right? Modern ones like Sous Vide eggs, Sous vide beef, Sous vide pork, Sous Vide chicken, Sous Vide Veg etc. I thought well, today people are more interested in these type of recipes. Who cares hor, about Sambal Belachan. Got Singalong ones. And so, hum a tune and open bottle can already mah. Or Penang Prawn Mee? Just add hot water to White Curry Mee instant noodles! Home-made Curry Puffs? Just buy chunky, I mean, Chang Kee ones. And so, I was working hard on multiplying my special TFC recipes. For example, I have 10 Sous Vide Egg recipes. You can do it at 60˚C, 63˚C, 65˚C, 68˚C and you get the drift. Each recipe will take a page. When you do it at 85˚C, you get hard-boiled egg! Brilliant eh? And then another 10 recipes for beef…55˚C, 60˚C, 55˚ C at 6 hours, then another at 48 hours. If you leave it on for 110 hours (that is 5 solid days…), you get minced beef! Genius! My mother would be so so proud. Yeah hor. I suddenly realise: all those millions of visits at the blog was about her. I am only the messenger, the mouth piece, a sign post. I am not even the sign - I am just holding up one. I suddenly and humbly realise, they are reading me to get to Mum. It’s Auntie Ruby, not TFC. I was beginning to feel like The Foolish Canon. But what to do. I don’t want to publish a cookbook which only my wife will buy out of pity. Or my staff, out of duty. And so, the hard work started. Assam Laksa, Sambal Udang, Assam Prawns. Smelly like anything. When the fresh prawns are not packed properly, my car smelled like death for a few weeks. I teared peeling shallots. And I was crying a river - bawling to be exact - by the time I tried to lesong them. Spoon some corn flour in. Using different verbs okay already. But EK is not OK. So, siau ah, I have to measure and weigh everything. By that time, dinner over already. Nice photos in the book right? One photo can take to up to half an hour, you know? Just curry chicken what? Not my wedding photo, right? By that time, food cold already. Oh sorry. This is thanksgiving speech. Not complaining one. Sorry. I come now to the most important part of my speech. Heh. I have never dreamed of being a preacher. And definitely, not an author. I had not even hoped to be a cook. No, no. I have always dreamed of being a SINGER. "Some people wait a lifetime for a moment like this..Oh, I can't believe it's happening to me..."
and tickers raining down on me, on my hair, my face and some sticking to my teary eyes. Actually, I really feel like Reviving My Mum's Classics now. Haha, this is the twist. You never saw it coming. My Mum was quite a songstress you know. "I hear that bell go ding dong. Deep down inside my heart. Each time you say, "Kiss me”…Ding Dong ding dong…"
The crowd was beginning to get restless. And this is another of my Mum's favourite classics: "Sio Ba Zhang, Sio Ba Zhang, Bueh Ba Zhang..."
The crowd was really getting restless. And, what about another Teresa Teng's classic: "Ni ai wo yi qian bei, Wo ai ni wan bei..."
By this time, the crowd was writhing in agony…shouting "Lame, lame speech….shut the mic…please..."
And you must hear another of my Mum's: "It was an Itsy Bitsy Teenie Weenie Yellow Polka Dot Bikini..."
Pandemonium broke out. The bikini song did it. 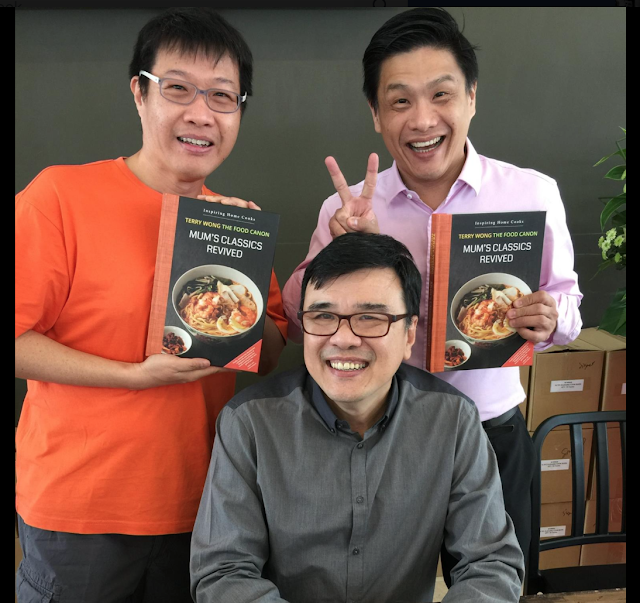 Many cookbooks were launched. Some did not miss. The TFC soldiered on and managed to finish his last few lines. Er, finally, I have to say this. A good cookbook needs to be used, not shelved. They were using it alright. The Cathedral Cafe (ask the counter) at St Andrew's Cathedral, $50, with profits going to charity. While you are at it, enjoy a latte. A brilliant and heartwarming speech! 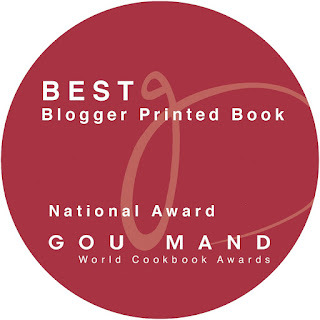 Congratulations on the cookbook! I will be buying one soon. My mother rang me a week ago to ask me to buy your cookbook for her online after she saw an article in the papers. I was only half listening to her and only remembered her saying "the food canon". And I thought, here's another mediocre local cookbook to add to her collection of 100ish cookbooks. I ended up buying the cookbook for her but it's only today that I realised that I have been using your recipes (especially the nasi lemak one) for years. I print them so I didnt realise that you were the author. I am very glad your I bought your cookbook for her and will buy one for myself too. Your recipes are great and I am glad your mom's legacy lives on. Congrats.